A three in one visit by Team RajNivas, with visible outcomes, for the good of Puducherry. 1 visit to Kalapet Beach project. Shall keep it under the lens of regular review. 2..Stringent Legal Action On K.V TEX for violation of Guidelines of Puducherry Planning Authority ( PPA) and Municipal Act and Rules. The business operation will be carried out subject to compliance of the EXTANT norms. (spot visit was made on the request of RWAs) Complaint found Primafacie genuine, in the presence of President Traders Association’s, Mr Shiv Shankar. 3. Botanical Garden opened for walkers. Morning and evening. Excellent for locals and tourists..
4. And the open air theatre to be used to for creative performances by children and others. 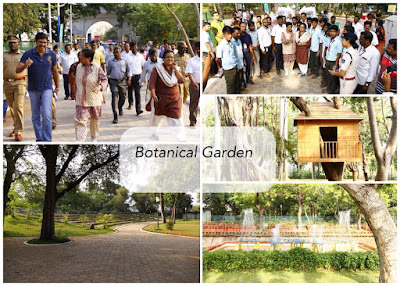 Botanical garden now open to morning and evening walkers. Free of any ticketing. All 7 days. 6AM to 9 Am. And 5-7. Inaugurated an empowering event. 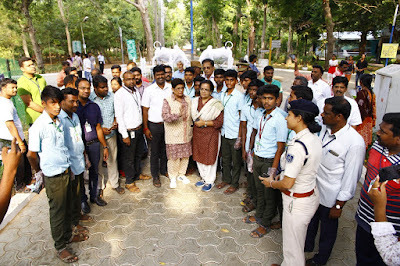 Where Girls were being trained to be courageous & bold by the Puducherry Social Welfare Dept. Survey conducted by an NGO revealed how girls feel restricted in their mobility because of incidents of being followed. Thereby lose out on economic and knowledge growth. Also due to insecurities of parents are forced into early marriage. And also educate less due to dowry demands from the higher educated. Courses shall be held for boys, parents & teachers+others. Trained girls will also be bold enough to report the Romeos. And report to the police on 1031 in confidence. All agencies will work together dealing with Child, Women, welfare, teachers sensitisation, university psychology dept, social work etc. FCC, women police etc. Sec Welfare shall coordinate the training needs. And conduct regular surveys to understand ground realities. Boys groups will be separately organised for them to listen to what girls have to say. These training programs are being funded by GOI under Nirbhay’s fund. Innovation comes by reflection of what is. And the willingness to change for the better. Also not to consume only but provide for now and invest in the future. In Human Resources or material. Also environment. Be it water saving or water generating, energy saving or energy generating. Also preparing the youth for responsibility taking by grooming them on leadership and team building. Puducherry Vision plan Document, department wise, for the decade ahead, must incorporate mission statement, policies, strategies and operating procedures or operating manual for training, continuity and sustainability with flexibility to keep evolving. We have to reform the past, provide the present and prepare Puducherry for the future. This is our destiny to make for a ‘Prosperous Puducherry’ for all.